Students presented their projects in the Fellowship Baptist Church auditorium. As a Creation Scientist, one of my greatest duties that I take great pleasure in is introducing the works of the Lord to the young generation. The sparkle of wonderment that fills their eyes in knowing the creative power of God fills my heart with the Lord's divine Love. It however saddens me greatly that the proponents of Evolutionism have corrupted this true purpose of science and are instead using it as a propaganda tool to spread Secularism. But what is education for if not to fight against ignorance such as that? Our children are the future face of Science and we must teach them to recognize the truth of the Word of the Lord so as to break the cycle of Evolutionism dogma that is paralyzing scientific development and making higher education a dumping ground for the excesses of materialistic philosophies. To that end, the Fellowship Baptist Creation Science Fair was started. Its purpose is to get kids excited about Creation and motivate them to discover the truth of our Lord on their own. 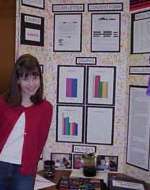 The Creation Science Fair is held annually and is open to homeschoolers and students from area Christian schools grades 1 through 12. The 2001 Fellowship Baptist Creation Science Fair was held on April 16th and great fun was had by all in attendance. 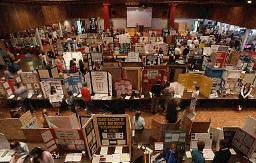 Fellowship is proud to be host to one of the largest Creation Science Fairs in the country, this year we had over 200 students present their projects. This is also the first year that Muslim students from the Al-Jannah Islamic school have been invited to participate; two of their students presented a project on human anatomy entitled "Allah (SWT) Created Me" which, while it was found ineligible for a prize due to a number of Biblical inconsistencies, did win a special Interfaith Outreach ribbon. Below is listed the winners of the major prizes in the three age groups. Space doesn't permit us to list all the many projects presented, however they were all of high quality and academic excellence. Remember kids, just because you didn't win a ribbon, doesn't mean you lost: when it comes to studying the works of the Lord, there are no losers! My special thanks to the staff of the FBCSF who helped compile this report. Cassidy Turnbull and her uncle, Steve, who is not a monkey according to Cassidy's research. 1st Place: "My Uncle Is A Man Named Steve (Not A Monkey)"
Cassidy Turnbull (grade 5) presented her uncle, Steve. She also showed photographs of monkeys and invited fairgoers to note the differences between her uncle and the monkeys. She tried to feed her uncle bananas, but he declined to eat them. Cassidy has conclusively shown that her uncle is no monkey. 2nd Place: "Pine Cones Are Complicated"
David Block and Trevor Murry (grades 4) showed how specifically complicated pine cones are and how they reveal God's design in nature. Patricia Lewis displays her jar of non-living material, still non-living after three weeks. 1st Place: "Life Doesn't Come From Non-Life"
Patricia Lewis (grade 8) did an experiment to see if life can evolve from non-life. Patricia placed all the non-living ingredients of life - carbon (a charcoal briquet), purified water, and assorted minerals (a multi-vitamin) - into a sealed glass jar. The jar was left undisturbed, being exposed only to sunlight, for three weeks. (Patricia also prayed to God not to do anything miraculous during the course of the experiment, so as not to disqualify the findings.) No life evolved. This shows that life cannot come from non-life through natural processes. 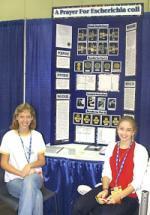 Eileen Hyde (right) and Lynda Morgan (left), future Creation Scientists. 1st Place: "Using Prayer To Microevolve Latent Antibiotic Resistance In Bacteria"
Eileen Hyde and Lynda Morgan (grades 10 & 11) did a project showing how the power of prayer can unlock the latent genes in bacteria, allowing them to microevolve antibiotic resistance. Escherichia coli bacteria cultured in agar filled petri dishes were subjected to the antibiotics tetracycline and chlorotetracycline. The bacteria cultures were divided into two groups, one group (A) received prayer while the other (B) didn't. The prayer was as follows: "Dear Lord, please allow the bacteria in Group A to unlock the antibiotic-resistant genes that You saw fit to give them at the time of Creation. Amen." The process was repeated for five generations, with the prayer being given at the start of each generation. In the end, Group A was significantly more resistant than Group B to both antibiotics. 2nd Place: "Maximal Packing Of Rodentia Kinds: A Feasibility Study"
Jason Spinter's (grade 12) project was to show the feasibility of Noah's Ark using a Rodentia research model (made of a mixture of hamsters and gerbils) as a representative of diluvian life forms. The Rodentia were placed in a cage with dimensions proportional to a section of the Ark. The number of Rodentia used (58) was calculated using available Creation Science research and was based on the median animal size and their volumetric distribution in the Ark. The cage was also fitted with wooden dowels inserted at regular intervals through the cage walls, forming platforms which provided support for the Rodentia. Although there was little room left in the cage, all Rodentia were able to move just enough to ward off muscle atrophy. Food pellets and water were delivered to sub-surface Rodentia via plastic drinking straws inserted into the Rodentia-mass, which also served to allow internal air flow. Once a day, the cage was sprayed with water to cleanse any built-up waste. Additionally, the cage was suspended on bungee cords to simulate the rocking motion of a ship. The study lasted 30 days and 30 nights, with all Rodentia surviving at least long enough afterwards to allow for reproduction. These findings strongly suggest that Noah's Ark could hold and support representatives of all antediluvian animal kinds for the duration of the Flood and subsequent repopulation of the Earth. Answers in Genesis' world-renowned Creation Museum holds an annual science fair for students across our nation who uphold the belief in the creation of the universe in six, twenty-four-hour days about 6,000 years ago by the Creator God as revealed in the Bible. Includes photos from previous fairs. Combining both Creation science and Biblical history. Held in Toronto by the Creation Discovery Project. A good list of topics for projects that relate to Creation Science and teachings from Scripture. Annual excursions to Lake Manitoba in Canada to find living a Basilosaurus. A wonderful field-trip opportunity for your Creation Science class. A professional, peer-reviewed technical journal for the publication of interdisciplinary scientific and other relevant research from the perspective of the recent Creation and the global Flood within a biblical framework. From Answers in Genesis. Features the Journal of Biblical and Scientific Studies and content for kids. The Christian answer to Evolutionist-controlled National Geographic! Full of informative articles on Creation Science. A must for students. Made of cardboard at 1/75th scale. Great for homeschoolers, Christian schools, Sunday schools and youth groups. Comes with 7 pairs of dinosaurs and 14 of other animals to scale to show just how big the Ark really was. Cartoon illustrations of the Ark, the Flood, and dinosaurs to use in your projects or displays. From Train2Equip.com. Drama: "Taylor Mitchell desperately needs his scholarship to stay in school. Physics Professor, Dr. Heinlein, insists that Taylor abandon his 'mythological religious approach' to creation and base his thinking on 'fact and the scientific method.' Taylor's final grade will depend on his fulfillment of Dr. Heinlein's assignment -- a scientifically sound paper on evolution. Is this truly a Test of Faith or an 'assignment on reality?'" Excellent dramatization of the issues that older students will face when they come in contact with Secularized colleges. Prepare them now.